Fiorina has not yet formally announced her bid. WASHINGTON (CNN) - Carly Fiorina, a likely Republican candidate for Senate in California, made public on Tuesday what her GOP primary opponent Chuck DeVore has long claimed: that the national party is supporting her bid to take out Sen. Barbara Boxer next year. "The chair of the National Republican Senatorial Committee has encouraged me to enter the race, reaffirming my belief that Chuck DeVore can not beat Barbara Boxer," Fiorina said Tuesday, according to SanDiegoNewsRoom.com. That remark elicited a swift I-told-you-so from DeVore, who for months has accused NRSC chairman John Cornyn of unfairly meddling in the Republican primary on behalf of Fiorina, the millionaire former CEO of Hewlett-Packard who was a frequent surrogate for John McCain during the 2008 presidential race. "We know that the entire Fiorina campaign is predicated on a recruiting effort by the NRSC," DeVore told CNN. "They may have an official policy of neutrality, but I know why she's running. It's because she was recruited." But DeVore said he has not made any effort to meet with national Republican officials because he knows who the NRSC is supporting, and doesn't want to provide them with "valuable intelligence that they would simply pass on to Carly Fiorina." The NRSC would certainly save a few bucks by having Fiorina as the Republican nominee: Whenever she decides to officially enter the race, she's expected to have a serious financial advantage over DeVore, who entered October with just $144,000 in the bank. A spokesman for the NRSC, however, is playing down the significance of Fiorina's remark. "Sen. Cornyn and the NRSC routinely meet with potential candidates around the country, oftentimes multiple folks in various states," committee spokesman Brian Walsh said in an e-mail. "We believe Barbara Boxer is uniquely vulnerable and her record is way out of step with mainstream America. If there are qualified candidates who want to challenge her that is a good thing. However, we've made clear that the NRSC has not endorsed any specific candidate and has no plans to do so." Fiorina! The woman who practically killed Hewlett-Packard?????????? California is not dumb enough to elect another Republican as governor! Go Carly! We support you in California...WE DEFINITELY WANT BOXER OUT - PRONTO! Can you do better, either spend more or spend less. Oh please, oh please get rid of Boxer! Life would get better if Waxman and Waters were gone as well. California has a way of voting in dopes and economy-killing policies. You wingnuts think Boxer is the least intelligent Senator, and give a pass to DeMint, Vitter, Ensign, Craig, Stevens, Kyl, McConnell, Bunning, Shelby, Cornyn, Chamblis, and the others in the GOP. But can Schwarzenegger beat Boxer? Carly would fit right in with the national disgrace know as republicans in the senate. We are so ready for intelligent representation here in California. 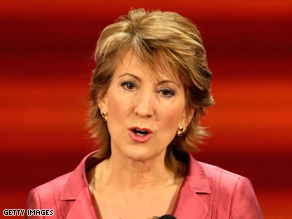 Carly Fiorina is one of the most successful business visionaries today. She knows where we need to go and how to get there. Say goodbye Barbara. It's been...well, it's been. If this is the best the GOP can offer, it is doomed to failure. California does not need another corrupt or stupid politician! The do-nothing president resembles his south-of-the-border ideological counterpart, Chavez, every single day and therefore the liberals will be defeated in 2010 and 2012!!! With the disaster she created at HP and her less than grand exit, yeah, she would make a wonderful Senator. You go GOP. She was also a disaster whenever she opened her mouth during the last campaign so she will do so well. The Republicans really need to come up with truly viable candidates to win anything today. Fiorina is NOT one of those.